NK News is an American subscription-based website that provides news and analysis about North Korea. Established in 2011, it is headquartered in Seoul, South Korea with reporters in Washington, DC and London. Reporting is based on information collected from in-country sources, recently returned western visitors to North Korea, stories filed by the Korean Central News Agency (KCNA), interviews with defectors, and reports published by NGOs and western governments. The site's founder and Managing Director is Chad O'Carroll, who has written on North Korea and North Korea issues for The Telegraph. 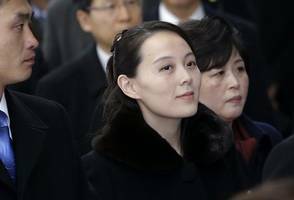 Business Insider reports the sister of North Korean leader Kim Jong un – and the woman considered the most powerful woman in the reclusive country – is believed to have been kicked out of North..